Back to my Ozotic swatches today with one of the more interesting colours in the range. Now when I say interesting, I mean it's weird. 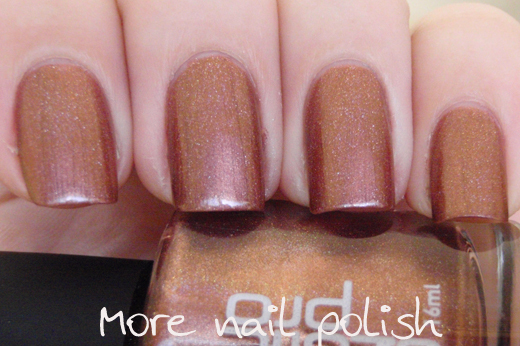 Ozotic 524 is a brown frost polish with fine holographic particles. 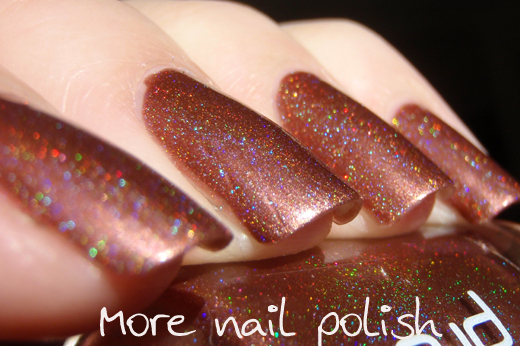 There doesn't seem to be enough holo particles in this to classify it as a linear holo, and the holo looks much stronger in the bottle than on the nail. It's such an odd combination, Mr Frosty McFrostyworthy and Miss Fairy Flutterpants had a love child called Ozotic 524. This is what it looks like most of the time indoors. I actually rather like the colour. It's neutral and calm and office appropriate. 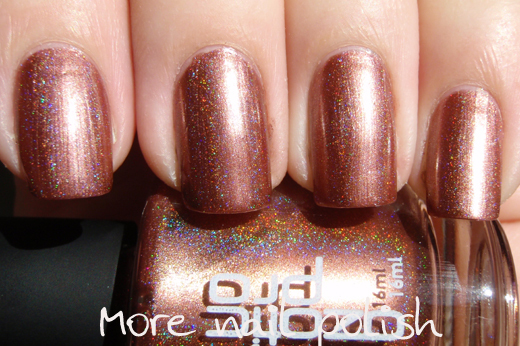 So unlike the other loud and in your face Ozotic Pro holographic polishes. I had a super duper break on my right index finger today, one where it comes off below the nail bed and you end up with a thin squishy bit of nail at the tip. At least my left photo hand is still good. I actually really like neutral holos like this & spin me round & FYI. Thanks for posting this! Classy neutrals definitely have their place with me. Ouchies on the nail Kitties and Claire I sure hope it was your nail and not your hand!! Been there and actually done that. Kristy, Claire and Catkin - Ouchies indeed, I discovered when I removed my polish that not only did I snap the index nail clean off, but my middle and ring finger had massive cracks too, so my whole right hand is nubbin city. It feels weird. Reece - I love neutral holos too, FYI and spin me round and some of the DS ones too. I think I need to pull them out a do some comparison pics. Bregje - Sorry for your wallet ;) and I have more coming too!